glad to know the Beautyblender is latex free and non-allergenic. It took me a few minutes to get the hang of how to use my Beautyblender but luckily they do include an insert in the packaging that gives you visual directions. It is recommended that you dampen it and squeeze out the excess water. Your Beautyblender will then expand allowing you the ability to cover areas of your face a lot quicker. But know there is no harm in using it dry. It worked great for me either way. Be sure to follow the directions and use the stipple-technique of tapping or bouncing the sponge up and down to apply your foundation. Trust me, this works and the final result is a wonderfully natural and extremely smooth, streak-free looking finish. I wear liquid and cream foundations and I couldn’t have been more impressed with each application. With the Beautyblender you have the option to go from light to full coverage if that’s your desire. They suggest that you use the rounder end for foundation and the pointy tip for concealer. Follow their recommendations, you won’t be disappointed! Depending on the type of foundation I use, it can take more than one or two thorough washings, but I definitely think opting for the Beautyblender will save you money versus buying dozens of wedged sponges. I was ready to place my usual order for those traditional sponges, but decided to invest instead in more Beautyblenders. With proper cleaning they can last up to three months and this cruelty free company will even recycle their Beautyblenders if you return them. 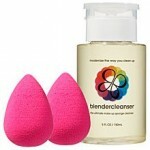 I can feel good about saying the Beautyblender is a definite must have for any makeup guru! Think all sponges are the same…think again beauties. The Beautyblender makes a big difference on makeup application.